Item description: Universal watch guarantee dating from the 1960s / 1970s. Light blue covers with golden designations. 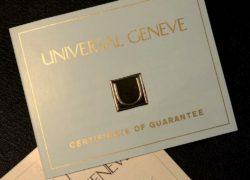 Universal ‘U’ logo in gold to centre. 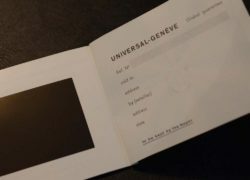 14 page guarantee booklet with various photographs. Watch detail pages at book not filled in. 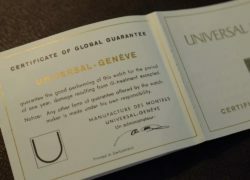 The guarantee sold together with a 1960s / 1970s worldwide service booklet. Condition report: New old stock. Storage age only.